Following the preliminary work carried out at the end of 2016 to create a new quay for Poole, Jenkins Marine have been assisting BAM Nuttall with the latest workon the £10 million quayside construction development in Poole harbour – the South Quay Project. The latest phase of works commenced in February this year. Jenkins Marine have provided specialised and highly manoeuvrable workboats to move the large crane barge being used for piling operations. This is usually a 2 x boat operation, using STOUR and FROME, and supervised by experienced Jenkins Marine operatives positioning the pontoon to within half a meter accuracy. Jenkins Marine vessels have also been involved in more general support services including the supply of storage pontoons (36m x 10m JML36 and 35m x 10m JML35), loaded with the new piles, to feed the piling barge. The new quay will need approximately 1,800 tons of steel piles, all of which will be delivered by sea. Jenkins Marine are also providing assistance with demolition work for existing structures, dredging, and additional piling barges. The project, which is due for completion by the end of 2017, will ensure that the Port remains competitive with facilities that can accommodate a much wider range of shipping and marine activities. For more information regarding Stour, Frome, JML35, JML36 or any of our other specialist vessels please contact Jenkins Marine or navigate to the relevant section of the web site. Multi role vessel STOUR is currently on charter to commercial diving contractors Seawork marine services (SMS), for diving works at Selsey Bill, on the UK’s south coast. SMS are working for the RNLI to remove seabed obstructions in the vicinity of the Selsey Bill life boat station, for fear of damaging the lifeboats. 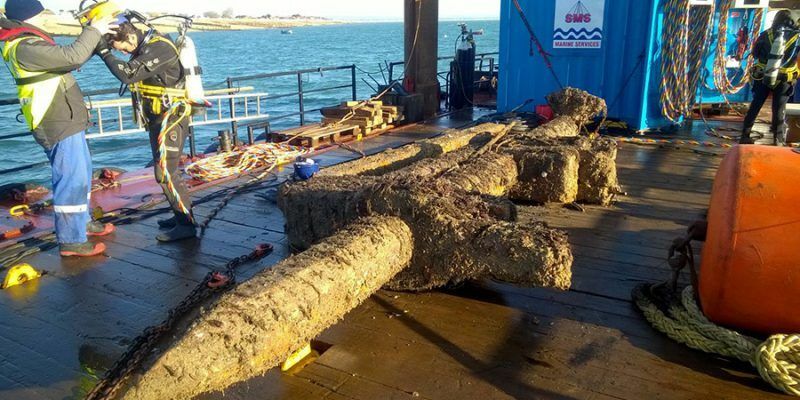 The former Selsey Pier was demolished some years ago, and the debris left on the seabed. SMS selected the multirole vessel STOUR for her generous deck area, able to accommodate both the dive container and equipment, as well as the large concrete debris from the pier, totaling up to 75t of deck cargo. In addition, the 65t/m deck crane has proved essential for lifting the large concrete sections (up to 8t each) from the seabed on to the deck, and unloading them to shore. STOUR has been based from Haslar Marina in Gosport, just inside the entrance to Portsmouth Harbour, from where she has steamed out and back to Selsey Bill each day. Positioning on site is achieved using the vessel’s two self-elevating spud legs, which can be remotely operated by the master from the wheelhouse, and take only a minute to secure in position – maximising dive time on site. Initial works are scheduled to last around two weeks, to be reviewed towards the end of January.